The question of the holiday season, wouldn’t you say? Or for many, the question that needs an answer by tomorrow morning. With Motorola hosting a $150-off deal on Cyber Monday (December 2) for MotoMaker and Developer Edition orders of the Moto X (our review), a number of you have asked us to put together some sort of comparison between it and the Nexus 5 (our review). This might be hard to believe, but for a limited time tomorrow, these two phones will be the same price. We’re looking at somewhat similar, yet also very different approaches to an Android phone, even though they are technically made by the same company. One focuses on convenience, the other on power and cleanliness. One wants you to design it and make it your own, the other remains subtle even in two color schemes, with the focus on the operating system. One is trying to be as developer friendly as it can, the other is the ultimate device for a tinkerer. Both offer incredible values. Both are updated faster than any other Android phone. 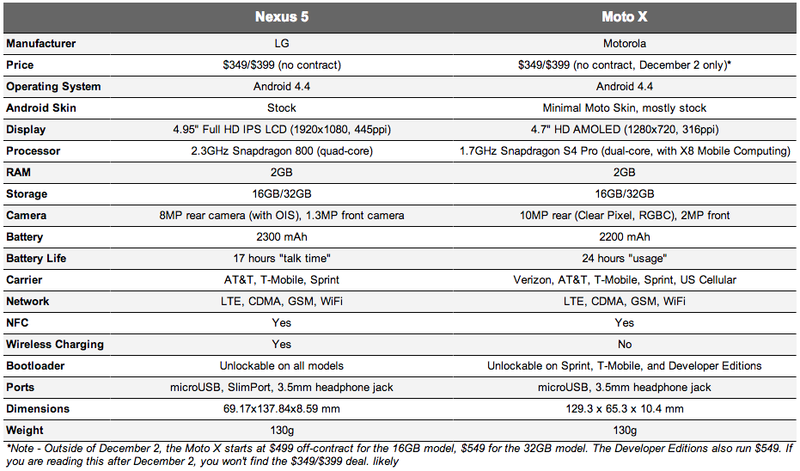 So, which is it – Moto X or Nexus 5? On paper, it’s tough to argue against the impressive set of specs found on the Nexus 5, especially when compared to the Moto X. As you may recall during the launch of the Moto X, Motorola had to do some pretty serious damage control over the idea that “specs aren’t everything,” since their 2013 flagship isn’t exactly topping anyone’s charts with its 720p display, 10MP camera, and dual-core processor. Of course, after using it for months we now know that they were right, and that all of the optimizations they made through their X8 Mobile Computing platform have made the Moto X far from inferior to other phones. But if you strictly want to look at how these two phones compare side-by-side with their respective set of specs, the Nexus 5 is the clear winner. Thanks to its 5-inch full HD 1080p display, top-of-the-line Snapdragon 800 processor, 8MP camera with Optical Image Stabilization (OIS), wireless charging, and easily unlockable bootloader, it’s tough for any phone to compete, especially with its asking price of $349. If you are looking for the best feeling device on the planet for 2013, it is without a doubt the Moto X. From it’s pillowy backside to the way it perfectly rests in your hand, or its ease of use when using a single hand, the design (even though it is plastic) of the Moto X should be award winning. Motorola carefully crafted a phone that still has a big enough display (4.7-inch), yet feels like the size of a phone made years ago. There are minimal bezels, a bit of added thickness to fit all of its hardware and add comfort, and subtle details like its back dimple that make you never want to put it down. Oh, and did I mention MotoMaker? At no extra cost, Motorola will let you customize a Moto X from its front or back colors to the accent around the camera lens. You can also tweak some internals, but the winner here is the hand-crafting of the exterior appearance, something no other smartphone OEM has been able to do to date. That’s not to say that the Nexus 5 feels terrible. 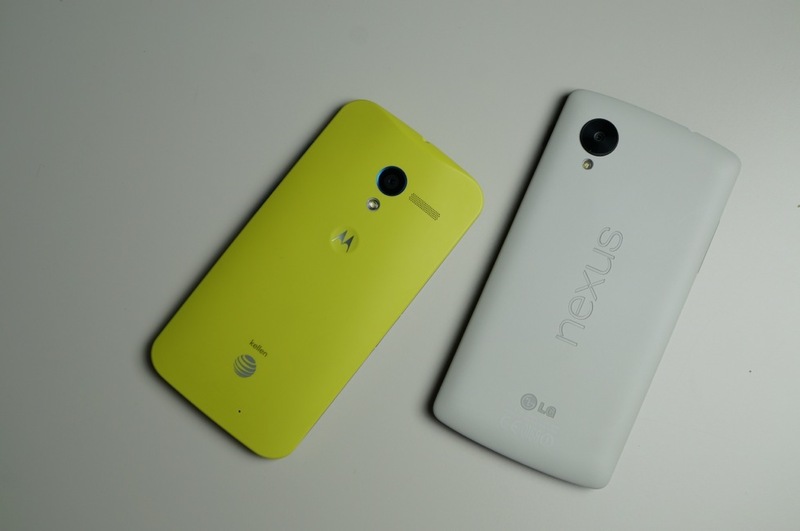 In fact, the Nexus 5 comes close to feeling as good as the Moto X, even with its added size. Google kept the finishes extra soft, gave you two color options, and threw in design details like high-end ceramic buttons that stand out while using. It also feels somewhat pillowy when held, however, the ultimately flat back isn’t quite as comfortable as what Motorola has produced with the Moto X. There are also fairly noticeable seams and edges on the Nexus 5 where the the display reaches edges and where the backplate meets the side panels. We aren’t talking uncomfortably sharp, just something you’ll notice when comparing it to a Moto X. In the end, in terms of design, you’ll have to choose whether or not a custom phone outweighs an extra bit of screen real estate. Both phones feel great in hand, my personal preference in this category is the Moto X though, if that wasn’t already obvious. Now that we have former Google execs running Motorola, it’s with no surprise that their vision of Android runs parallel with Google’s. Stock Android is indeed king on either the Moto X or Nexus 5. With the Nexus 5 though, you are getting the latest version of Android, updates before anyone else (for the most part, right Nexus 4 owners? ), and a true vision of what the Android team thinks of its mobile operating system. To add some extra spice to the Nexus 5, Google tossed in a new Google Experience Launcher (GEL) that is an exclusive. GEL is like a 2013’d stock Android launcher that brings Google Now to the front of the line with an always-listening “OK, Google” command. It also feels so much more polished and new school with transparent items and animations, a new (and old) way to add widgets, and a bigger overall appearance. The Phone app is much smarter than that of the Moto X, as well. The rest is pretty much just stock Android 4.4. That’s not a bad thing, it’s just that with the Moto X now running Android 4.4 as well, there is little that the Nexus 5 can do from a software perspective to stand out. With the Moto X, you are also getting stock Android, but Motorola has thrown in a handful of add-ons that some would argue (“some” meaning us) have made this the best phone of 2013. Every time I pick up my phone or take it out of my pocket, the screen partially turns on with a clock and notifications (also called “Active Display“). No buttons need to be pressed for this to happen. Active Display might be the single greatest smartphone software feature to be introduced in the last three years. But that’s not all that Motorola tossed in. If I want to take a picture in an instant, I can do so using a wrist-twisting gesture that once again, does not require the press of a button. And last, I can talk to my Moto X even with its screen off and have it perform all sorts of actions (called “Touchless Control“). The Nexus 5 has to be unlocked and sitting on your home screen in order to be able to perform something similar. The Nexus 5 also requires you to tap the wake/unlock button on your phone, then swipe a camera icon or edge of the display to get into the camera for photo taking. You tell me which is quicker. Our review discusses these three Moto X features in detail, but for me, these might be the ultimate separators between the two phones, especially now that Motorola has shown it can update this phone as quickly as Google can with some of its own Nexus devices. If I had written this post two weeks ago, before Motorola shocked the world with its Kit Kat update, this section may have come off much different. Neither the Moto X or Nexus 5 are going to win any photo competitions any time soon. I think it’s safe to say that the quality of photos taken with either are below that of the Galaxy S4, LG G2, Note 3, and new iPhone. I’d imagine you already know that though, and are fine with a decent camera if you are deciding between these two. That’s not to say that either is a terrible camera (well, the Nexus 5 tries to be at times), it just means that they take decent pictures. To see sample photos taken with each, be sure to hit up this Moto X post and our Nexus 5 review. You tell me which you think wins that battle. Instead of focusing on quality of photos, I’ve got some other reasons why I would pick one camera over the other. Generally speaking, I like smartphone cameras that are simple to operate and stay out of my way, that are updated often to improve picture quality, and can be launched in a matter of seconds. For those reasons alone, the Moto X camera is my choice between these two flagship phones. The Nexus 5 – with its 8MP sensor and Optical Image stabilization – sounds like it should be a top tier smartphone camera, however, with its inability to focus, slow loading times, and dead-looking photos, Google has an immense amount of work to do to get this camera right. Again, my review tells you what I think of the Nexus 5’s camera. Spoiler alert – I hate it (in its current state). The Moto X on the other hand, isn’t perfect yet manages to be good enough in a lot of ways. As was previously mentioned in the software section, the flick of a wrist launches the phone for instant picture taking. The UI has been minimized on it so dramatically, that you are left with only a few settings and really only one focus: to take pictures in a hurry. It’s shutter speed is fairly fast, has no trouble focusing, takes decent low-light shots, and works good enough out of the box without having to adjust a thing. Well, there aren’t any options to adjust, so it better work. Motorola has started to prove that they want to take smartphone cameras seriously by pulling the camera app out of the Moto X and making it available for updates on Google Play. With this move, they can fine-tune the experience as regularly as is needed. With the first update to the camera, they made such major improvements that the outlook for Motorola and cameras can only be a positive one. Google has kept its camera app as a part of stock Android, so updates to it can currently only come through over-the-air operating system updates. They are apparently working on one that will fix the camera on the Nexus 5, we just have no idea when that’ll be. By the time they get around to it, Motorola may have issued another enhancer or two for the Moto X. The Nexus 5 camera certainly has potential, a timeline for fulfilling that potential is currently MIA. And that has been the story of Nexus cameras for years. Are you are a Verizon customer? If yes, you have two choices. Buy the Moto X, since it’s available on every major carrier in the country, or leave Verizon, find yourself a plan on T-Mobile, AT&T, or Sprint, and then think about the Nexus 5. The Nexus 5 does not work on Verizon’s network whatsoever, for reasons we can only guess. If you are on AT&T, T-Mobile, or Sprint already, then the good news is that get to try and weigh all that we have just walked through and decide which is the phone for you. The Nexus 5 is sold unlocked, so it can much more easily be moved from one carrier to another, while the Moto X if purchased directly from carriers is essentially SIM-locked to those carriers. If you are in good standing with AT&T, they should unlock your Moto X to work with T-Mobile’s network, but that takes a bit of work. There is also a GSM Developer Edition of the Moto X that should be SIM-unlocked giving you a bit more flexibility. For the most part, you are looking at trade-offs with either phone here. No Verizon for the Nexus 5, but the Nexus 5 is also much more flexible should you be interested in changing carriers often. The Moto X is available everywhere, it just isn’t as flexible when it comes to carrier jumping. As mentioned previously, the Moto X is going to be $349 or $399 on December 2 in a massive Cyber Monday sale through Motorola’s online shop – that includes both MotoMaker orders and the Developer Editions. After December 2, the phone will more than likely go back up to its $499 and $549 price points. The Nexus 5 is $349 and $399 every single day of the week should you buy it through Google Play. It won’t go up in price, unless you buy it directly from a carrier. As much as I love the Moto X, the price of the Nexus 5 is simply too amazing to pass up, unless of course you are buying one of these two phones on December 2. At $349 for the Moto X, with the software enhancements that Motorola has done along with free customizations through MotoMaker, it may be the best Cyber Monday deal we have seen in years. You’ll be leaving behind a 1080p display and the potential that is an OIS camera, however, the rest of the package may outweigh those two highlights from the Nexus 5. You guys probably know that I’m a Moto X fan, like, a really big Moto X fan. I’m also now a massive Nexus 5 fan outside of its camera. Both phones perform amazingly well, they run the newest version of Android (Kit Kat) before everyone else, and provide us with the preferred stock Android experience. Motorola has added some amazing features that make it stand out from all smartphones (Active Display, Touchless Control, etc. ), while the Nexus 5 is pretty bare bones outside of the Google Experience Launcher (which can be sideloaded on your Moto X if you really need it). But the Nexus 5 has a far superior display, while the Moto X gives you one-handed operability, a better overall feel, and the option to customize it at no extra charge. The camera experience on the Moto X is also leading the way at this stage in their lives. So what do you do on Cyber Monday? Talk about a tough decision. At $349 for the Moto X, it just seems like too good of a deal to pass up on. But then again, the Nexus 5 has everything you could ask for in a 2013 smartphone, yet manages to fall in at the same price every day of the week. If you had been holding out on a Moto X purchase, then I think you know what you need to do tomorrow. If you are still trying to decide between the Nexus 5 and Moto X after reading all of that, I’m not sure anything else I can say will help. At some point, you need to pull the trigger, not ask someone else to do the dirty work for you. For those with credit card in hand, the Moto X Cyber Monday deal kicks off tomorrow (December 2) at 6AM Pacific, 9AM Eastern.